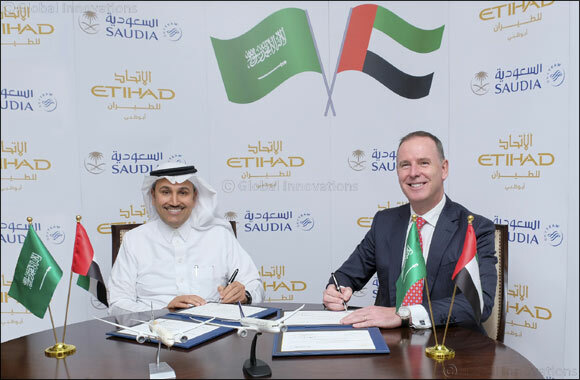 The codeshare agreement will see Etihad Airways place its ‘EY’ code on Saudia’s flights to, Abha, Al-Baha, Alula, Arar, Bisha, Dammam, Dawadmi, Gassim, Gizan, Gurayat, Hail, Hofuf, Jeddah, Jouf, Madinah, Qaisumah, Rafha, Riyadh, Sharurah, Tabuk, Taif, Turaif, Wadi-Ad-Dawasir, Wedjh, Yanbo, and Abu Dhabi. Port Sudan, Tunis, Alexandria, Sharm el-Sheikh, Multan and Peshawar are subject to Government approval. At the same time, Saudia will place its ‘SV’ code on Etihad flights to Baku, Chengdu, Ahmedabad, Nagoya, Tokyo-Narita, Dammam, Jeddah, Madinah, Riyadh, Belgrade, Seychelles, Chicago-O'Hare, and Abu Dhabi. In the cargo world, the teams in both airlines’ divisions are in talks about greater cooperation, recognising the increased volumes of freighter traffic flowing into and out of the UAE and the Saudi Arabia.